At Toy Car Care, we believe that everyone is entitled to take their vehicles where they want for repair and maintenance. And yes, you can skip the Toyota dealer service center even if you purchased your car there. In fact, you can go to an independent service facility like ours, a retail chain shop, even handle the general maintenance and repairs on your own if you choose. The Magnuson-Moss Warranty Act ensures that it is illegal for manufacturers or dealers to claim that your warranty is void because someone other than the dealer helped repair or resolve your car problem. Some situations, however, may not be covered. For example, if you replaced a belt improperly and your engine gets damaged as a result, the manufacturer or dealer may deny responsibility for fixing the engine under the warranty, which is understandable. 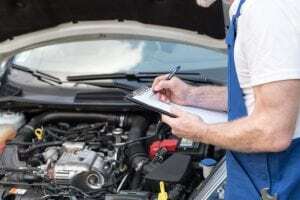 But, according to the FTC, the manufacturer or dealer must be able to demonstrate that it was the improper belt replacement that caused the damage to your engine, and the warranty would nevertheless be in effect for other parts of your car in this case. Just remember to stick to your owner’s manual schedule which provides the right factory scheduled maintenance timeline and be sure that you don’t skip oil changes or tire rotations! Toy Car Care has all the service technicians that are trained and skilled in every aspect of vehicle repair and maintenance. Consumer Reports suggests that you only need to use a dealer for work covered under warranties, vehicle recalls, post-warranty fixes hopefully paid for under the manufacturer’s “good will” program, high-tech systems that require a dealership’s specialists, as well as software updates. In general, if your Toyota needs parts, it is often in the range of about 30% more for a dealership to source the part as opposed to an auto parts store or independent service and repair center. That’s a huge price jump, but the dealership usually has their hands tied because the dealer doesn’t want to install a part that he didn’t source, because if it fails, how does he warranty it? Food for thought. No doubt, you will probably form a closer, more personal relationship with an independent repair shop versus a Toyota dealer service center. You probably will never see or meet a dealership mechanic, and you and your car are often just a number versus a face. A smaller garage will usually know you by name and discuss any Toyota vehicle repairissues at hand directly with you. This is a nice bonus! A smaller shop wins this fight as well, because more often than not, your local garage is just down the street from where you live, like here in Centennnial, and dealerships are usually located in an industrial area or busy part of town. A smaller garage wins again because the Toyota dealer service center has rules and regulations that do not allow them to get to into the customization aspect of things such as performance modifications, upgrades, and aftermarket parts. We all know that a Toyota dealer service center is incredibly expensive compared to an independent shop. It is always best to ask around and get a few quotes and a good feeling from whichever service center you are choosing. Go with your gut on who you think will be your best decision. Overall, the 3 main points to ask your repair shop would be prices, certifications, and warranties. Be sure you feel they can do the job with precision, and ask around about their reputation, including companies such as the Better Business Bureau. Word of mouth is usually a good indicator that they are competent in what they do. Make sure they specialize in your make and model of vehicle to ensure they are skilled and qualified to do the work and don’t be afraid to ask for a special rate or discount. So just remember that, no, you don’t have to go to your Toyota dealer service center in all situations where maintenance or repairs are involved, but be sure to do your homework and know what is covered and what is not regarding warranties. Toy Car Care will give you honest and accurate information if you are ever in doubt, and lead you in the right direction. Schedule your appointment today with a service center that knows a thing or two about the vehicles you drive. Our location and service bays are convenient, large and clean, offering you the best in the business.